I wanted this image to be soft and light but it lead to poor contrasts despite increasing the background tone with grey and red conte. 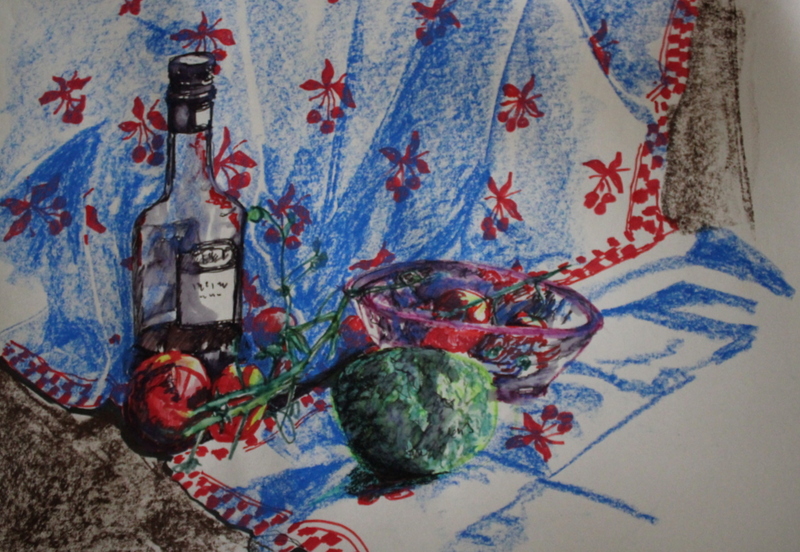 His paintings, which have a flare and colour of folk art consist of ” busy”colours and shapes, flowers, stripes and checks which produce a visual confusion and I wanted to set up a still life in which I could try out this idea. 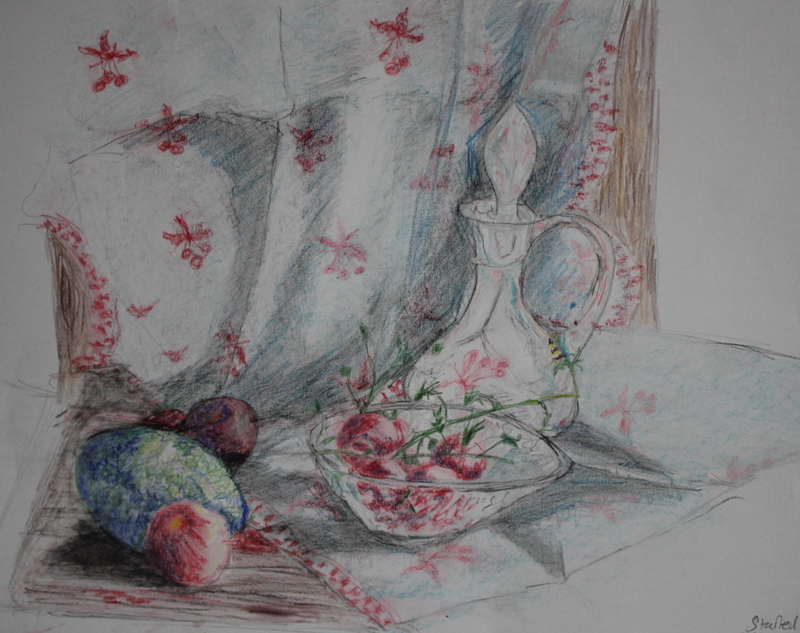 I couldn’t find anything of sufficient colour or “busyness” and so the still life was disappointing. The drawing was done on a roll of lining paper which is quite absorbent on one side (the side used) and shiny on the other side. I liked the “business” of the picture. I took a photo prior to the addition of ink to the picture and this helped to pick out areas which needed work, the picture was far too light and sketchy and the objects were not positioned well on the paper. My sketch lines are very shaky (perhaps due to present fatigue) I decided I liked the soft blue wax crayon of the background but not the black ink. I then repeated the same composition using much stronger colours -in oil pastel and felt tip, bringing the objects closer and larger in the frame. Also done on the wallpaper this attempt is very bright and gaudy and not what I wanted to achieve. The oil pastel was nice to work with on the larger paper but the felt tip too “constrictive”. The colours clashed, but the reds and greens were much more prominent. I then decided to change the composition and introduce a more delicate container of vinegar. This was started in H6 pencil and very light coloured pencil as I wanted to keep things very light, however in attempting to produce tone I could not get much variety in the pencil, so I introduced conte crayon and wax crayon, smudging the conte which lead to areas of dirty smudges which detracted from the very light vinegar bottle. 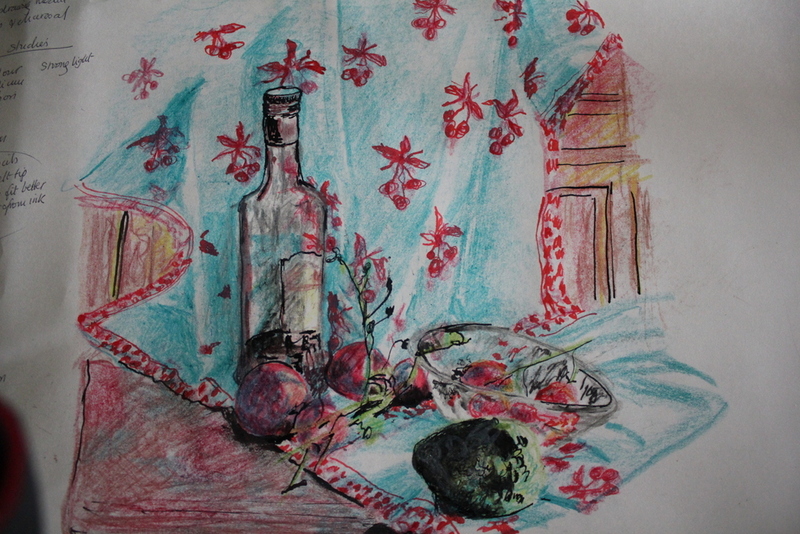 I don’ think the composition is as good as the second drawing in oil pastel in which the vinegar bottle takes the eye and I did not achieve the “business” of flowers, stripes, checks and colour as in the Fassett pictures. The strength and confidence of the lines left much to be desired. Reflection: What did I do? 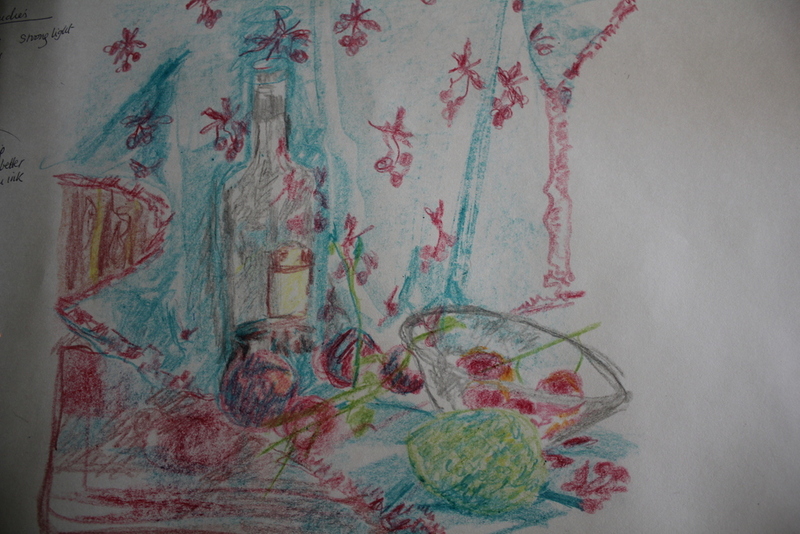 I used several media to draw a still life composition in an attempt to imitate the style of Kaffe Fassett . How do I think or feel about this? I am very disappointed with the results but feel I had not provided enough subject matter of lively pattern to produce the effect I wanted. The quality of the drawing is poor and looks under confident and fearful and the final picture much too contrived, lacking the power or the liveliness of the Fassett pictures, partly due to the light pencil and crayons used, but I think it would have been difficult to represent the clear glass of the vinegar bottle in the final picture in other media. What did I learn? Fill the picture, be bold and lively, avoid very fine pencil unless the image has little tone. What will I do differently next time? Be bolder. more confident and less fearful, enjoy the media and represent rather than attempt to be too fine in detail. Avoid H6 pencils. What have I achieved? Three different representations of similar compositions which carry different feelings, the final assignments is restrained and feels tight, the second felt tip and oil pastel representation is bolder and picks up the tonal contrasts well and the first image is probably the best, being looser with interesting and harmonious colours and a flowing composition. How have I put any theory into practice? I have thought about the combination of colours and media and the blending of colours as well as considering tonal variations and composition. How does what I have been doing lead me to become better at a skill? I think with continued observation particularly of the same subject the subconscious recognition of the shadows and forms lead to freer and easier sketching of the subject. Practising with media will also lead to greater understanding of their interactions. Do more practise and experimental images and don’t stop till you are happy–these images are for you not the OCA. How can I use this plan for the future? Practice! How can I use this to plan new learning experiences? I don’t find it possible to plan what a picture will turn out like and so continued practice and understanding media is important. Pick objects for the subject matter that approximate to the desired effect.